Eating two large meals early and skipping dinner may lead to more weight loss than eating six smaller meals throughout the day, research presented at the American Diabetes Association Scientific Sessions conference this week in Chicago suggests. Researchers from the Czech Republic followed 54 patients with Type 2 diabetes for 24 weeks. The study participants were split into two groups at random. Both groups followed a diet that reduced their energy intake by 500 calories per day and contained 50 to 55% carbohydrates, 20 to 25% protein and less than 30% fat. For the first 12 weeks, one group ate three main meals - breakfast, lunch and dinner - and three small snacks in between meals. The other group ate a large breakfast between 6 and 10 a.m. and a large lunch between noon and 4 p.m. The two groups then switched for the second 12 weeks. Researchers asked the patients not to alter their exercise habits during the study. Although both groups lost weight and decreased the amount of fat in their livers, the group that was eating only two larger meals lost more during each 12-week session. Eating fewer, bigger meals also led to lower fasting blood sugar levels, meaning that the body's insulin production was working more efficiently. The timing and frequency of the groups' meals did not seem to have an effect on the function of beta cells that produce insulin or on the glucose metabolic clearance rate - i.e. how fast their bodies were able to process and get rid of sugar. "This is interesting," says CNN diet and fitness expert Melina Jampolis. "But the first thing I think of is that it's not really liveable, telling people to skip dinner every day." Jampolis is also concerned that the two groups did not end up eating the same total number of calories. "Eating six times a day, it's very hard to control calories," she says. The researchers admit that while they did their best to ensure both groups consumed the same amount, the group that ate two larger meals may have eaten less. While the study was small, Jampolis agrees that there's research to support eating a lighter meal later in the day. Most of us consume the majority of our day's calories late at night when we're the least active, she says. And when we're not active, our insulin sensitivity drops. A recent study showed that walking for just 15 minutes after dinner can help lower your risk for diabetes. Fasting between lunch and breakfast may have a similar effect, she says. Don't skip dinner altogether. 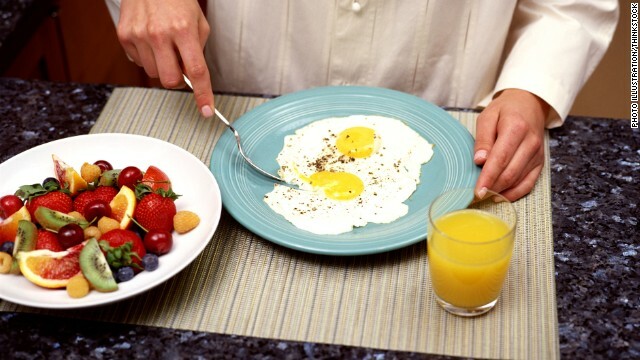 Focus instead on eating a hearty breakfast and lunch, and keep your last meal of the day low in calories. Thanks for another informative site. Where else could I get that type of information written in such a perfect way? I have a project that I am just now working on, and I've been on the look out for such info. Hello very nice web site!! Man .. Beautiful .. Amazing .. I'll bookmark your website and take the feeds additionally…I'm satisfied to seek out numerous useful info here within the submit, we want develop more strategies in this regard, thanks for sharing. . . . . . It's a pity you don't have a donate button! I'd certainly donate to this outstanding blog! I suppose for now i'll settle for book-marking and adding your RSS feed to my Google account. I look forward to brand new updates and will share this website with my Facebook group. Talk soon! You really make it seem so easy together with your presentation but I in finding this matter to be really one thing that I feel I'd never understand. It sort of feels too complex and extremely huge for me. I am looking ahead to your next submit, I’ll attempt to get the dangle of it! I always keep hearing the news bulletin speak about getting endless online offer applications and so I have already been exploring the optimum online site to have one. Could you advise me please, in which might i get some? Hi, You must have done an admirable job. For certain I will definitely digg it and personally suggest to my buddies. Most likely they shall be benefited from this website. I drop a leave a response when I especially enjoy a article on a website or I have something to contribute to the discussion. It's caused by the passion communicated in the post I read. And on this article. I was actually excited enough to post a comment 😉 I do have 2 questions for you if you do not mind. Is it simply me or do a few of the remarks look as if they are written by brain dead folks? 😛 And, if you are posting at additional online sites, I would like to keep up with you. Would you make a list every one of your community sites like your twitter feed, Facebook page or linkedin profile? "Hi, my name is NAME and I agree with this post. I even made a video about this issue a while ago. Anyway, I'm not necessarily into posting comments but your post just happened to grab my attention there in the sidebar, while I was browsing through."